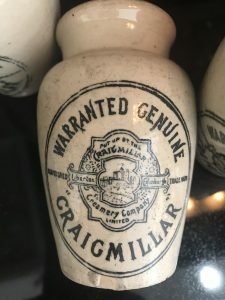 I will select one of these great Warranted Genuine Craigmillar Cream from my current inventory. This Antique English Advertising piece contained cream in the late 19th to early 20th century. Perfect patina for old and buried ironstone pots from the 19th century. There is lots of character here. Display beautifully! Please Note: Most of these antique pots have some level of crazing, may have spots of discoloration, light hairline cracks and minor chips and fleabites that should be considered additions to character and do not detract from its display value. These are expected due to age, use and let’s not forget they were often buried for many decades before being dug up and rescued.